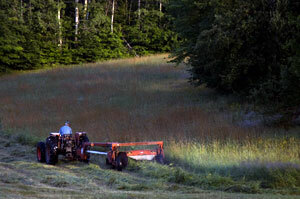 Grass–growing grass, drying grass, baled grass, chopped grass–is the engine that powers the Bromley farm. A cow turns grass into milk and manure. 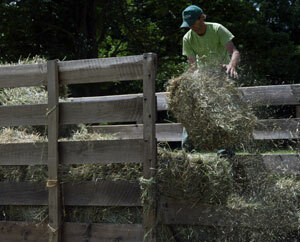 A framer turns milk into money and turns manure into fertilizer to grow more grass. It is a simple yet elegant cycle, repeated every day, twice a day over the years, over the decades and over the centuries. The greening of the meadows and pastures is the signal that finally and formally closes winter’s last chapter and starts anew on spring’s scrambled page. Spring does not start with the longer days or the warmer winds or the now boot high mud and slop out back of the barn. Nor is it the returning robins or the near empty silos and hay maws. These are all things of late winter when we are all seduced by the calendar into believing the grass really is greener on the other side of the snow fence. A dairy farmer sees growing grass as growing food, something that doesn’t have to be shoveled or spread or unloaded or hauled. A cow sees growing grass as something different to eat, something succulent and tasty and easy to chew, not something dry and coarse and so, so familiar. They both see growing grass as a reason to get out of the barn and stay out of the barn; more time to eat, less time to clean up and finally time to wander old paths. But Roger knows the winter pasture, greening as it may be in early April, is as wet and cold and ragged as an old towel left outside and forgotten. Put 50 cows out to pasture too early and the soft ground will be cut up like so much dirty confetti, killing tender grass shoots before they really get started and ruining it for later grazing. A dairy farmer sees a greening April pasture as a May mud hole lying in wait. The greening of the land does set off a cascade of activity on the farm, the end of each chore necessary for the beginning of the next. The back barnyard is scraped with tractor and blade, pushing up great blubbery mounds of mud and slop that ooze and sag and creep back toward the barn with every new rain. When the piles dry they will be scooped up with the backhoe and trucked down to Hoppers to be spread on the fields below. When the last snow melts and the phoebes have returned with the April rains it is time to mend all the fences of the farm. Every fence line is walked and every fence post–grown, cut and sharpened on the farm–is given one firm ‘tonk’ on top with a heavy iron mallet. Not two ‘tonks’–too easy to break an old but still useable post- and certainly not three. Just one solid ‘tonk’, and one ‘tonk’ only. If the post wobbles badly it is replaced, otherwise it is on to the next one. The miles of barbed wire are also inspected and repaired as needed; breaks are mended with spare lengths of wire and sags are tightened with a tug and a tap on the loosened or new staple in the post. Fence mending goes on all summer and fall; as long as there are cows in the pastures there will holes in the fences. Such is the relationship between a 1400-pound animal and a one-pound brain. Once the fences have been stitched back together and all the posts properly thumped- one ‘tonk’ only–it is time to begin moving all the cows to their summer quarters. First to see the other side of their fences are the oldest heifers that have spent the winter in the old heifer barn up top. They get released into the wilds of the high pastures; part meadows, part forest and completely unsupervised. They roam about like a gang of bovine hoods, happy to be ignored but always in want of some attention. Roger won’t have much to do with them until snow is in the air and the ground is well frozen. Down around the cow barn the youngest calves come out and move into the barnyard pushing the yearlings from behind the barn where they have spent all winter to across the old town road and into the long meadow above the sugar house. The calves are about a third of their adult size at this time but they will gain 300 lbs, a bit less than 2 pounds per day, by the time they come back to their wintering area behind the barn. The yearlings, the graduating class before the calves, are also packing on the pounds. They will gain 200 or more pounds over the next 6 months as they shed the last of their baby cuteness and grow into an adult’s bulk. The milk cows go up to the end of the old road and spend the entire day out and about, eating to their mighty stomach’s content. Each will be eating now for two, for every one, assuming the bull has done his job, should be several months pregnant. Soon, when there is enough grass to sustain them, they will stay out all night and the barn will be empty for much of the time. When trilliums bloom in the woods and barn swallows nest in the many old nooks it is time at last to turn the soil and plant corn seed. Once all the manure piles have been spread on the fields–about two weeks of afternoons if the weather cooperates and nothing breaks down- each field is harrowed two, sometimes three times. Harrowing disturbs the top four to five inches of soil, the first row of blades shoving the soil to the right and the following row pushing it back to the left. Plowing goes twice as deep and turns over the soil better but it takes twice as much time and brings up twice as many rocks. Roger tries to ignore the small rocks but he can’t let the big ones go by. He knows that every year the rocks will reappear like stubborn weeds in his vegetable garden but he can’t stop the gathering. It is a matter of pride for Roger to have a mostly rock free cornfield. 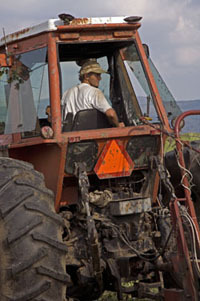 To Roger, it is a sign for all others to see that he is a proper, hard working farmer. A rocky field is a sloppy field and a sure sign of a lazy, careless farmer. For every rock larger than a football Roger stops the tractor, climbs off, carries the rock back to the harrow and places it on the frame. 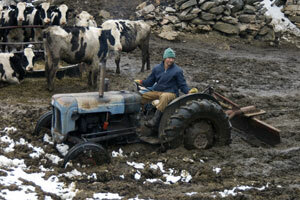 After a few hours on the field the top of the harrow is a pile of rocks and Roger is tired and sick of lugging stones. But the field is smooth and soft and ready. The corn seed is dropped, spaced and covered with dirt automatically by the seeder towed behind yet another tractor. None of this is fast work and no rushing is allowed. No rushing is even possible as the tractor plods along a scoosh faster than a walk when Hugh is driving and a touch faster than that when Roger is at the wheel. But despite the seemingly tedious nature of the slow back and forth it is not boring at all. There are more rocks to look for and fetch, field edges to scan, horizons to examine, swallows to watch, clouds to ponder and ridgelines to trace. When I have ridden alongside Roger, perched on the wide tractor fender like a Dalmatian on a beer wagon, I got the sense of sailing a boat on a small pond; tacking back and forth, slicing through the dirt, the mind clear but for the next turn as the grassy edge of the shore ever approaches.